The Bad Step Walk, Skye, Misty Isle, Glen Garry, Balmacara, Torrin. Friday the thirteenth. Not the best date to tackle Skye's infamous 'Bad Step'. And the warnings were there long before we reached the Misty Isle. After a generally pretty lousy week, we struck a red deer hind while driving through Glen Garry on the journey up. Fortunately, we escaped injury, but the car looked a little sorry for itself as we limped into the campsite at Balmacara shortly before midnight and drowned our sorrows in two rather pleasant bottles of red wine. The deer will be ruing the day it leapt out across the A887 in front of a red Mazda. The collision broke three of its legs and ruptured its belly and, while still alive, we had to drag the hind's bloody carcass off the tarmac and finish her off in the verge with a hammer. And all this on the eve of Friday the 13th. Just what would the fateful day itself bring? The following morning we drove to Skye, took the road from Broadford to Torrin and parked up just south of the tiny crafting hamlet of Kilmarie. Rucksacks packed, we headed east over the track to Camasunary, crossing land now owned by the John Muir Trust. 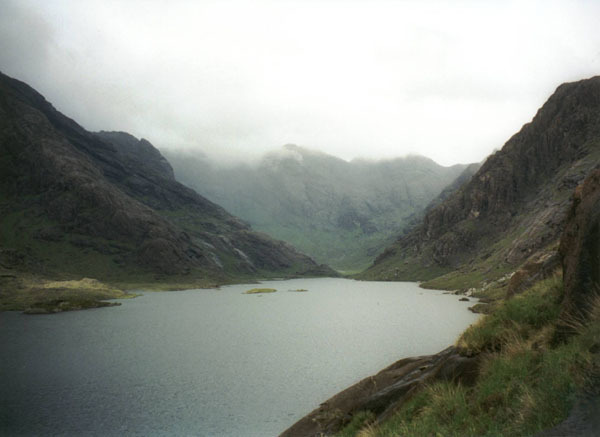 The route was bulldozed out in June 1968 by the army as part of a plan to improve access for anglers to Loch Coruisk. The track made it as far as Camasunary but proposals to press on round the coast, destroying the Bad Step in the process, were abandoned following an outcry from mountaineers. The track rises up over Am Mam before descending steeply to the bay. There are two buildings here. The first is a private house while, half a mile on at the other end of the bay, there's an open bothy maintained by the Mountain Bothies Association. With the rain lashing down, we decided to put in here for a late lunch of soup and biscuits. There was no hint of a change in the weather, so we prepared to spend the night at Camasunary, pitching our tents on the flat grass outside the bothy and gathering driftwood from the beach (although there was precious little of this). By 6pm supper was on and a roaring blaze occupied the grate in one of the bothy's two main rooms. Other walkers soon drifted in, arranging their soggy socks and boots around our fire. 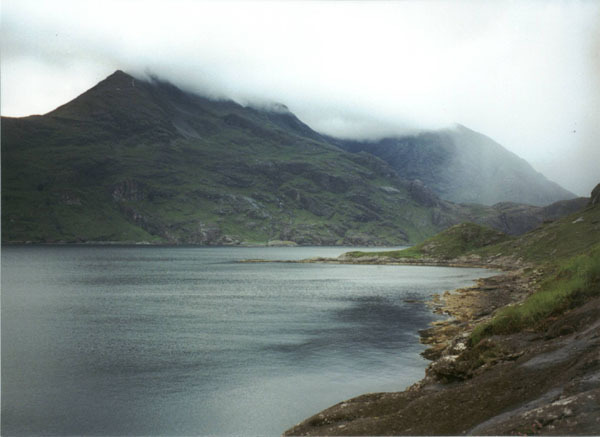 By eight, the clouds were slowly parting and we decided, having only walked a few miles so far that day and feeling distinctly lazy, to push on round the coast to Loch Coruisk. The first obstacle in our path was the Abhainn Camus Fhionnairigh, a relatively wide stream at the west end of the bay. In days gone by there was a bridge here, but it was demolished in the 1980s and the only way across now involves paddling. With the tide out, we opted to wade the chilly flow close to the sea where the channel was perhaps a foot deep at most. On the far bank, the path is easily picked up and it skirts round above Rubha Ban. Underfoot conditions were pretty wet and muddy but progress was easy enough and we were rewarded with occasional glimpses of otters playing in the clear, shallow waters along the shoreline below. A low-lying promontory is soon reached. Here the path curves inland, cutting between a knoll on the left and steep craggy slopes above to the right. 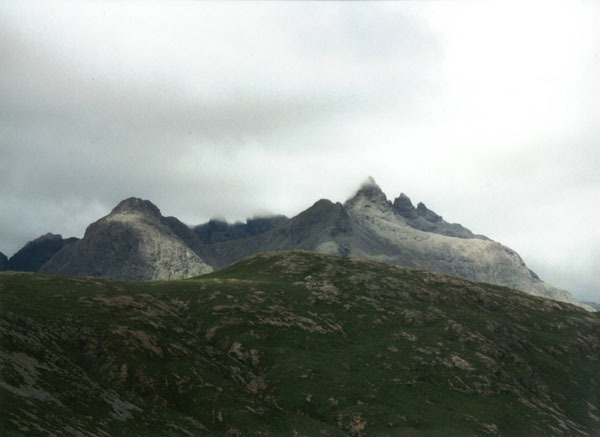 It then heads north below the rugged west flank of Sgurr na Stri to reach the Bad Step. There are a couple of easy scrambles before this point, but there is no doubting the 'step' itself when it is finally reached. The path descends to a point just above the shore, clambering over some boulders to the start of the step. With a dog in tow, we faced the additional challenge of having to get him over. He was rather more reluctant than we were but, with the light beginning to fade, our crossing had to be made. The first task is to pull yourself up on to a spine of rock sitting at about waist height. To the right of this there's a deep crack in the rock, about a foot wide, and, to the left, a steep drop into salty water. Once on the spine, you have to edge along it like a tightrope walker for around five or six yards as it rises gently, placing hands on the rock on the right to steady yourself. The next stage is easier, a slight crack in the slab providing good purchase for boots. This forks. Take the left hand option and the crack broadens out into a ledge about a foot wide, which descends to the other side of the step. 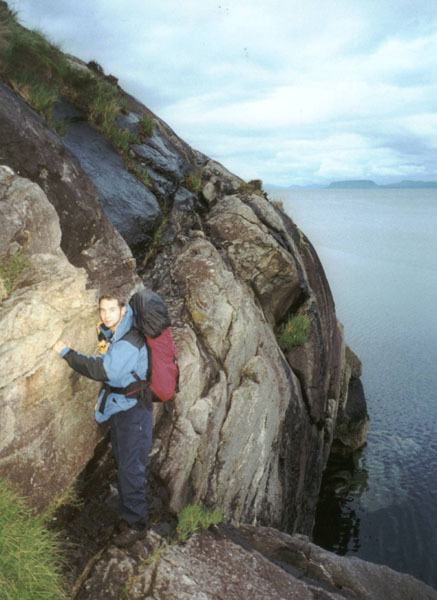 Negotiating the Bad Step is not overly difficult, but it does take a bit of nerve, particularly as one mistake could see you slithering down over the rock and plopping into the sea below. Reassuringly, we reckoned the water is probably deep enough to soak up a fall and the seabed at this point isn't too rocky. Once we'd settled our nerves, we picked our way through rocks and a copse of small trees towards the beach at the head of Loch nan Leachd. The slope here is slabby, making route finding frustrating as each time you think you have a good line, you find yourself brought up short by another band of slippery wet rock. 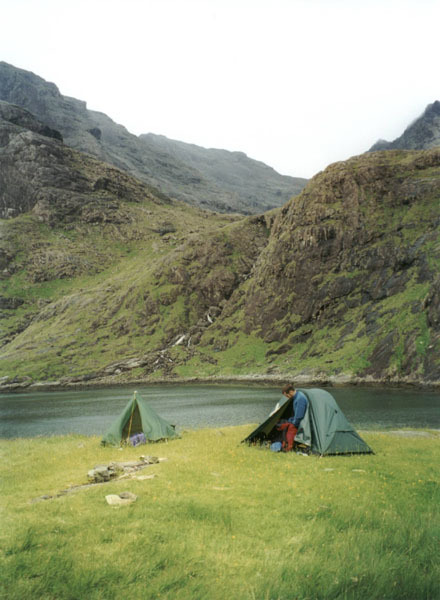 Thankfully, the path improves as you near the Stepping Stones at the head of Loch Coruisk. We crossed and skirted round to the memorial hut (locked) above Loch na Cuilce where a flat strip of grass above the pier provided us with a fine, if breezy, wilderness campsite. The following morning we returned to the Stepping Stones, crossed the river once more and headed north on the path skirting the eastern shore of Loch Coruisk. If you're feeling fit, you can add a circuit of the loch to your day, taking you right into the black heart of the Cuillin, perhaps one of the best places from which to fully appreciate its brooding drama. The path away from the loch climbs up to Loch a'Choire Riabhaich, then on to the shoulder beneath Sgurr Hain where the views of the Cuillin ridge are spectacular. A well made path descends into Strath na Creitheach and, as the path begins to flatten out lower down, it is possible to take a rough short cut across the glen to join the path on the other side, following it south east to Loch an Athain and then south to Loch na Creitheach. The path leads back to Camasunary and the route is completed by following the track over Am Mam, back to Kilmarie. Start/parking Car park at Kilmarie on B8083 Broadford to Elgol road (grid ref NG 545173). Grading A long walk through remote country with the Bad Step to negotiate. One for experienced walkers with some scrambling ability.